I'm on another great road trip of the American Southwest! This is perhaps my 6th or 7th 1000+ mile road trip into a region that continuously inspires me. My first stop on this trip was the Spring Mountains which abut Las Vegas but are a world away. 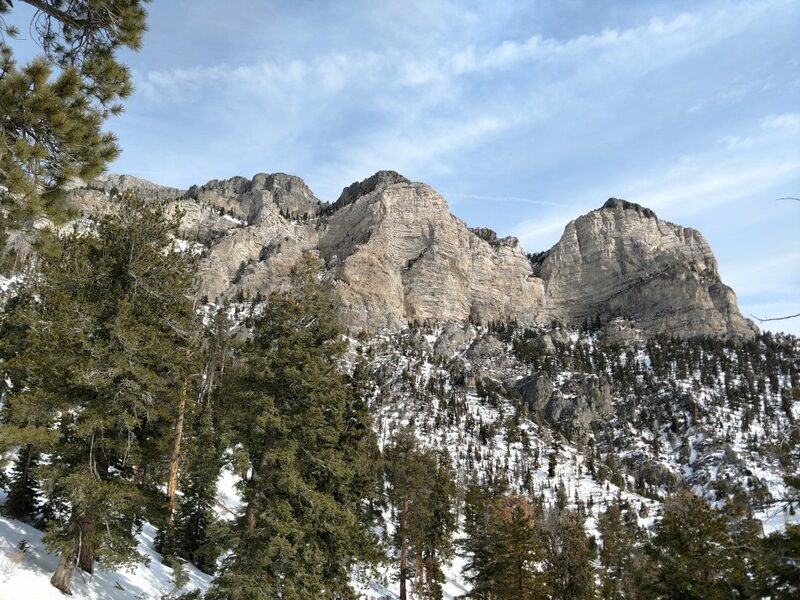 I attempted to climb Mt Charleston, the nearly 12,000-ft mountain that overlooks the valley but had to settle for a shorter sub-peak due to conditions. But it was a great adventure nonetheless. The Spring Mountains rise 10,000-ft above Las Vegas though their only about 15-20 miles away. Its an entirely different world. 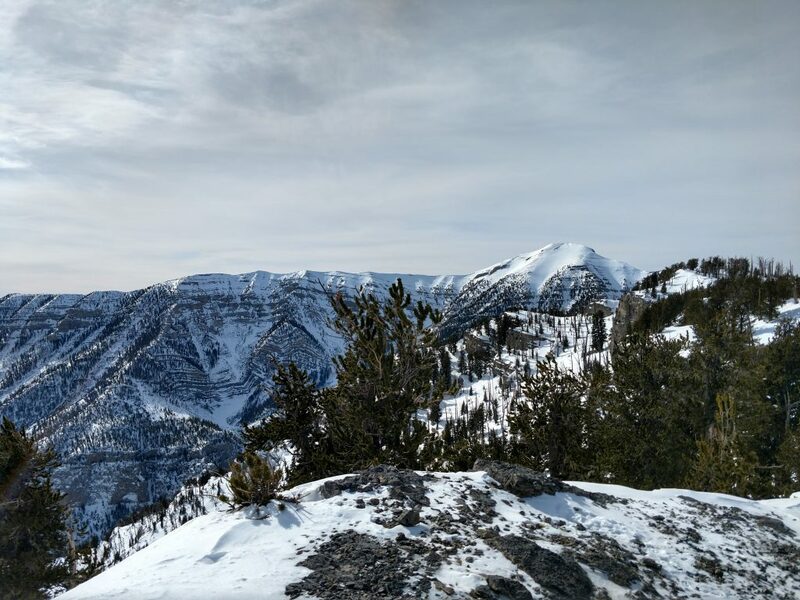 There's one mountain hamlet in the range known as the town of Mt Charleston (not to be confused with the mountain it was named after). This is both a summer and winter destination; summers are for escaping the desert heat and winters are for skiing at Lee Canyon. Rarely, however, do hikers and climbers visit in the winter. I found this out nearly 8 years ago on a similarly ill-fated attempt on Mt Charleston! 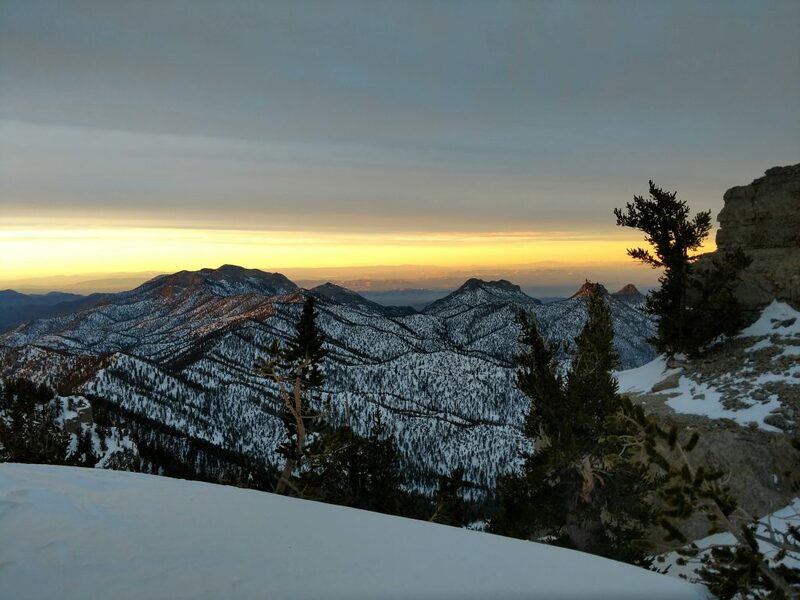 There's couple things to know if you're visiting Mt Charleston in the winter for non-skiing outdoor recreation. First, not all the trailheads are open- in particular, the entire Cathedral Rock area and hence South Loop trailhead are closed and gated. I was disappointed as this is the preferred approach of Mt Charleston. Also, the Trail Canyon Parking area is closed and gated too but the nearby parking lot for Echo Canyon is open. So, as far as established routes go for Mt Charleston, that left me with Trail Canyon-Deer Creek Approach. In the summer, the Trail Canyon-Deer Creek route is class I hiking. If completed as an out-and-back, its 16.5 miles. Frequently hikers combine this trail with the South Loop for an 18 mile day with over 5,000ft of elevation gain. Its a whole 'nother ball game in the winter. 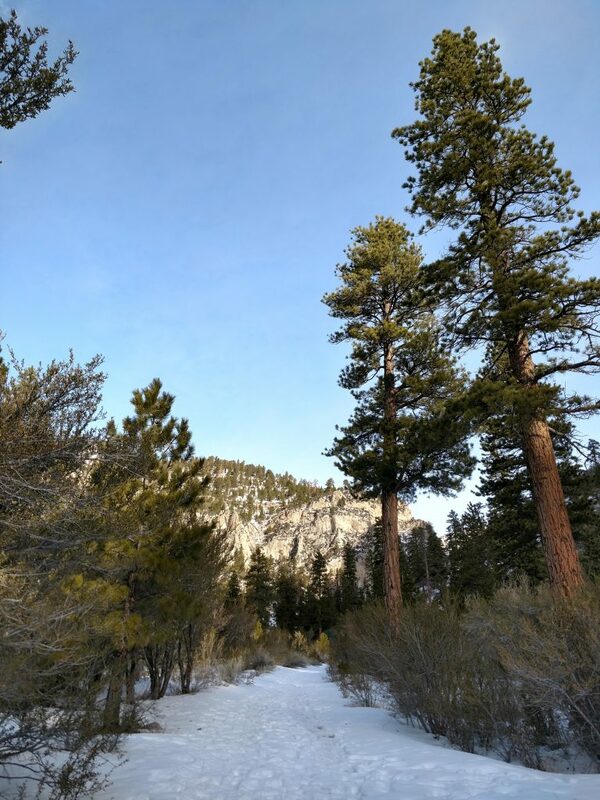 After parking at the Echo Trailhead, I packed a heavily loaded winter backpack and headed off. I walked the road about 0..5 miles to the actual trailhead. My altimeter at the start read 7,650-ft From here, I began the 2 mile climb up Trail Canyon. I took the obvious left and began ascending to Mt Charleston's very long ridge-line. The trail was still cut by some other determined snowshoes but the tracks were noticeably thinner. 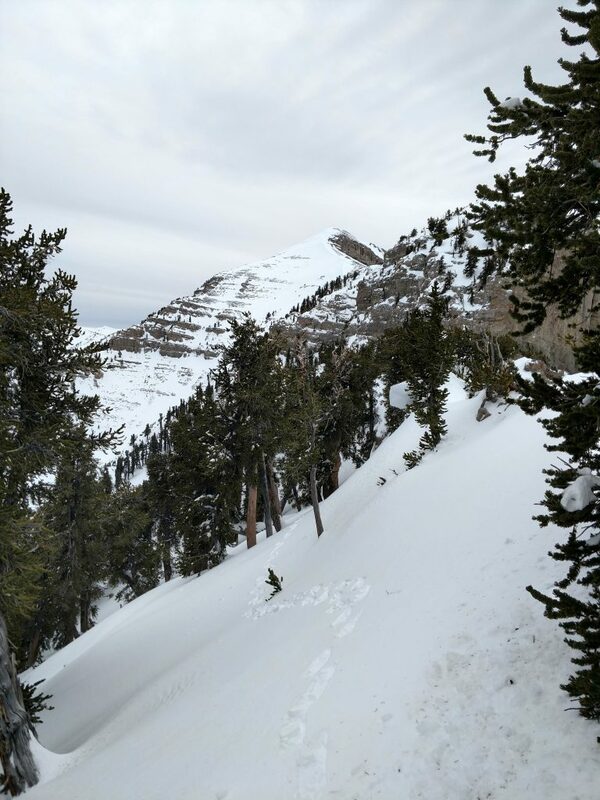 At about 10,000-ft, I had to put on snowshoes myself to avoid postholing. Naturally I started to slow. 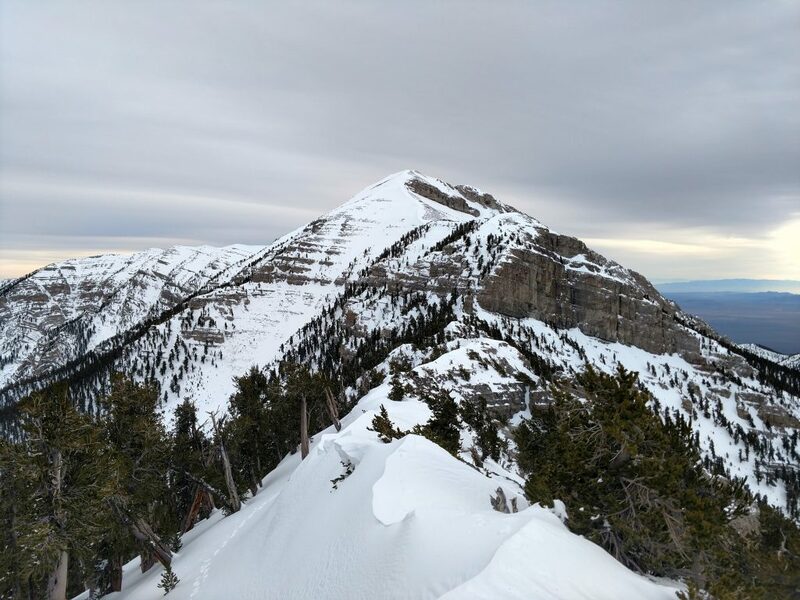 If you're attempting this in winter or any other snowy month, know that the trail is not well marked and obvious wasn't designed for winter hikers. It crosses very steep slopes and is not very obvious. I used my digital topo guide to help stay on route. Eventually I followed the switchbacks all the way to the ridgeline. 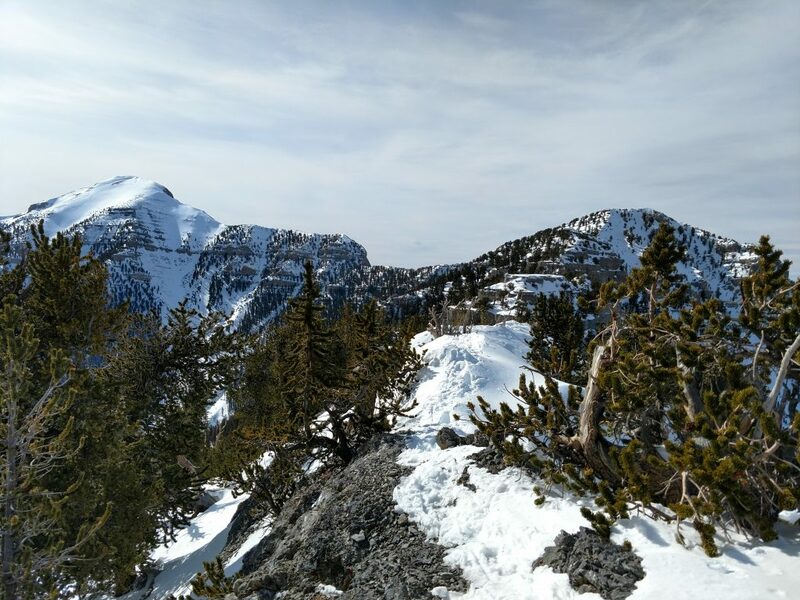 Standing at 10,500' of elevation and with a clear view of Mt Charleston, I trudged on. The Ridgeline, Lee Peak and many "Pointless Up-and-Downs"
This is where things got dicey and my rose-colored glasses were fogged up by 50mph icy wind. From a topo map, the ridge-line looks punctuated by small sub-summits that are easily tackled. In the winter, this is not the case. I think the folks that cut the path I took up figured this out early and turned around. For the next 4 miles, I was on my own. Several years ago when hiking in the Appalachians, I heard a fellow hiker describe a particularly hilly section as "full of PUDs; pointless-up-and-downs". I've loved the term ever since. This hike/climb had plenty of them! My pace slowed to less than 1 mile per hour as I continued to cut my own trail and avoided unnecessary altitude gain and loss. I found myself beat about half a mile and 1,000 vertical feet from the summit. There were several problems. First, the snow conditions were fairly poor for me; it was a layer of firm ice on top of deep powder. Snow shoes wouldn't punch through and I slid frequently. When I tried crampons, I immediately punched through the ice and post-holed to my waist. I settled on snowshoes but this just made things slower. What really caused me to turn back was looking at the very exposed summit with long runouts. I wasn't confident in my ability to do this solo in these conditions and decided to head back. To be sure, I knew this was quite possible this time of year but I was disappointed anyways. Going back down was just as slow. The 50-70 degree slopes were no easier in the late afternoon and I resigned myself to a dark descent. I did climb Lee Peak and delightfully found a summit register. At least I climbed something named today! Darkness fell and the moon rose. Full moon hiking in a snow-covered mountain range is actually quite pleasant. Though dead tired, I admired the tranquil scene. But when I looked up at the moon, I saw it half gone! I forgot about the lunar eclipse! I've seen several lunar eclipses in my life. Mostly I read about it somewhere and then woke up in the middle of the night to see the red-tinged moon. I might be awake for 10 minutes seeing it before promptly returning to sleep. I might not even remember it in the morning. Seeing the lunar eclipse from 10,000 feet and in a wilderness valley was an entirely different experience. I watched as the Earth's shadow slowly engulfed the pale-white moon and the mountains turned to darkness. The moon's color slowly faded to an orange and then characteristically blood-red. I continued descending under this ominous scene. What terror this must have caused people before understanding the physics behind a lunar eclipse! My overall rate was literally 1 mile per hour this trip. The combination of altitude and cutting my own trail for 4 miles probably caused such a slow rate. Though bummed I didn't achieve the summit, I was elated that I saw an entire lunar eclipse for the first time in my life. I can hang my hat on that! Adventure is out there! The Pursuit of Life is an outdoor adventure blog that’s dedicated towards providing guides on a variety of outdoor activities and wild places in the United States and Canada. This is a blog for people of all levels and experience and is not limited to any state, province or sport. Activities that are covered in this blog include hiking, mountain biking, climbing, kayaking, mountaineering, thru-hiking, caving, trail running, trekking, canoeing, ice climbing and general exploring.